Klebsiella pneumoniae (KPN) has emerged as one of the major nosocomial pathogens threating the public health worldwide, since it could cause multiple infections in patients with low immunity, including pneumonia, liver abscess, urinary tract infection, meningitis, and bacteremia . Furthermore, the easy access to multiple drug resistance and strong dissemination ability make KPN seriously threaten the human health [2, 3]. Recently, the increasingly acquisition of severe resistance to antibiotics and scarcity of effective treatments have aroused public concern and awareness of these great difficulties and challenges brought to clinical treatment . There are limited alternative drugs for multi-drug resistant KPN infection, among which tigecycline (TIG) is one of the remained most active antibacterial agents worldwide . However, with the increase of clinical application, the steady increased drug resistance rate and decreased sensitivity to TIG have threatened these last line therapies . Therefore, it is of great research value and clinical significance to find effective means to overcome the resistance of KPN to TIG. Pulmonary infection caused by multidrug-resistant KPN is one of the most common infections . Due to the lack of available alternative drugs, TIG is commonly used “off-label” for "off label" indications (78%) in nosocomial pneumonia with multidrug-resistant KPN infection . Moreover, in clinical treatment, it is often necessary to increase the dose of TIG to increase the concentration of drug in the lung. The increased dosage of TIG is usually accompanied with an increase in serious adverse reactions, thereby resulting in a clinical treatment failure. Therefore, how to increase the concentration of drug in the lung and reduce the systemic adverse reactions has become another urgent problem in TIG application. Nano-drug delivery system (DDS) has been extensively used in tumor targeting therapy and drug resistance [8-10]. In addition, previous studies have suggested that some nanocarrier systems could improve the efficacy of antibacterial drugs and reduce the adverse reactions by improving the biodistribution and permeability of drugs to the target tissues and avoiding nonspecific diffusion to normal organs [11-14]. In the meantime, in order to achieve personalized diagnose and treatment, it is necessary to monitor the biodistribution of DDS in vivo. Thus, multi-functional nanoparticles for bioimaging and drug loading can come in handy. As a wide-band gap semiconductor material, β-Ga2O3:Cr3+ have attracted wide attention due to their special conductivity and luminescent properties. By doping with different rare earth or transition metal elements, β-Ga2O3 can radiate various photoluminescence spectra from visible light to near-infrared light[15-17]. Although β-Ga2O3:Cr3+ has been widely used in optoelectronic devices, there are very few studies on the simultaneous application of gallium oxide for in vivo imaging and drug delivery. Furthermore, in order to combat the bacterial resistance and achieve targeted therapy, surface modification of the nanoparticles is needed. Polyethylene glycol vitamin E succinate (TPGS) is considered as a safe and excellent nonionic surfactant, which is widely used in DDS. Recent studies have revealed that TPGS can reduce the resistance of multidrug-resistant tumor cells by inhibiting the efflux function of efflux pumps [18, 19]. The mechanism of drug resistance in tigecycline-resistant Klebsiella pneumonia (TRKP) is related to the high expression of RND-type efflux pump genes (AcrAB and OqxAB) and upstream binding site (ramA) [20-22]. Therefore, the application of TPGS to inhibit the expression of bacterial efflux pump genes may be an innovative and effective approach to combat TRKP and treat pneumonia caused by TRKP infection. On the other hand, by modifying the surface of nanocarriers with ICAM1 antibody, targeted delivery of endothelial cells and inflammatory sites could be achieved through the specific binding of ICAM1 antibody to ICAM1 receptor on the surface of endothelial cells [23-25]. 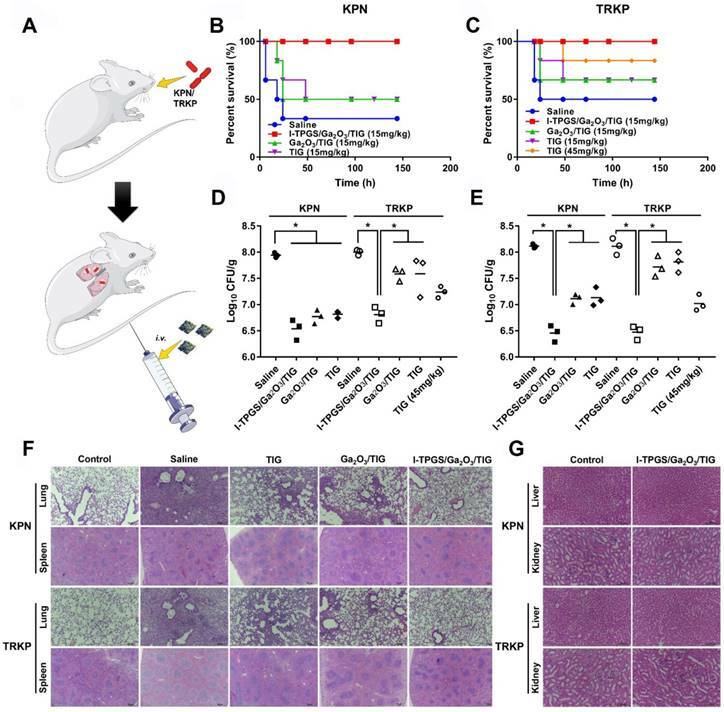 The expression of ICAM1 in KPN infected mice was significantly up-regulated, suggesting that DDS modified with ICAM1 antibody is expected to achieve targeted drug delivery in the treatment of TRKP pulmonary infection. Here, we firstly prepared β-Ga2O3:Cr3+ nanoparticles for loading the antibacterial drug of TIG. 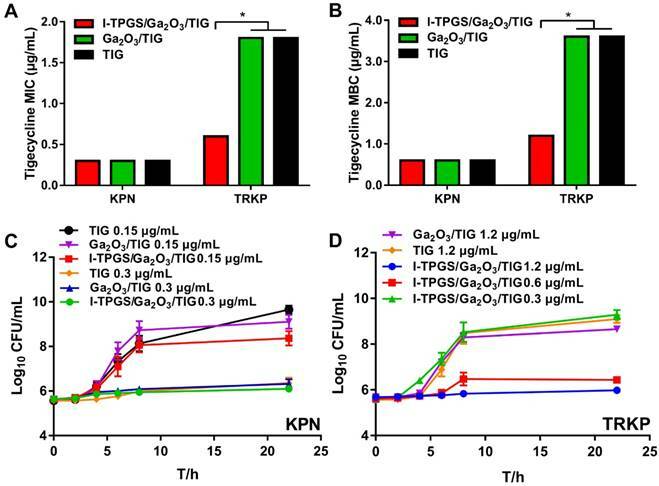 To achieve targeting capabilities and bacterial resistance inhibition, the TIG-loaded β-Ga2O3:Cr3+ nanoparticles were subsequently modified with ICAM-1 antibody-conjugated TPGS. The morphology characteristics, in vitro bacterial internalization, drug resistance inhibition, cellular uptake and lung targeting ability of anti-ICAM1-TPGS/β-Ga2O3:Cr3+ were investigated in detail. In vitro and in vivo antibacterial activities of anti-ICAM1-TPGS/β-Ga2O3:Cr3+/TIG were further studied. Firstly, the GaOOH:Cr3+ nanoparticle as a precursor was prepared at a mind temperature of 95 ℃ (atmospheric pressure) via the adjustment of pH of different reaction mediums. The preparation of β-Ga2O3:Cr3+ nanoparticles were improved by the method described in our previous research. First, the precursor GaOOH:Cr3+ nanoparticles were synthesized via hydrothermal method. However, unlike most other hydrothermal processes used to synthesize GaOOH:Cr3+ (>200 ℃ and reaction kettle) [27, 28] we managed to achieve the synthesis of GaOOH:Cr3+ under milder reaction conditions by adjusting the reaction medium, pH and temperature (95 ℃, atmospheric pressure). In addition to greater safety and ease of operation, this modified hydrothermal method also helps to expand the reaction capacity. The transmission electron microscopy (TEM) images revealed that the GaOOH:Cr3+ nanoparticles prepared by the hydrothermal method was spindle-shaped, and evenly distributed with particle sizes of 10-20 nm (Figures 1A&B). Then, the β-Ga2O3:Cr3+ nanoparticles were obtained by high temperature calcination of GaOOH:Cr3+. We found that the β-Ga2O3:Cr3+ nanoparticles had particle size distributions of around 15 nm, but they were severely aggregated when they were dispersed in water (Figures 1A&B). On the other hand, the β-Ga2O3:Cr3+ nanoparticles showed well-dispersity in water with slight change in the sizes when TPGS was added into the system. This result suggested that TPGS as a surfactant was successfully adsorbed onto the surfaces of β-Ga2O3:Cr3+ nanoparticles, which could prevent the particles from aggregation. The successful formulations of GaOOH:Cr3+ and β-Ga2O3:Cr3+ nanoparticles were also confirmed by the X-ray powder diffraction (XRD) measurements, in which the diffraction peaks of GaOOH:Cr3+ and β-Ga2O3:Cr3+ were similar with those of JCPDS 06-0180 and JCPDS 41-1103, respectively (Figure 1C). Preparation and characterization of anti-ICAM-TPGS/β-Ga2O3:Cr3+/TIG. (A) TEM images of GaOOH:Cr3+, β-Ga2O3:Cr3+ and TPGS/β-Ga2O3:Cr3+ were taken. (B) The hydrodynamic particle size distribution (PSD) of GaOOH:Cr3+ suspended in water, and PSD of β-Ga2O3:Cr3+ nanoparticles suspended in water and TPGS solution were detected respectively by dynamic light scattering (DLS) at room temperature (n=3). (C) The X-ray powder diffraction (XRD) spectra of GaOOH:Cr3+ and β-Ga2O3:Cr3+ were carried out with a Cu Kα radiation source in the 2θ ranging from 10 ° to 90 °. (D) 1H NMR spectra of TPGS and TPGS-COOH recorded in deuterated chloroform. (E) Loading rate and encapsulation efficiency of Ga2O3/TIG and I-TPGS/Ga2O3/TIG nanoparticles under various feed ratios (n=3). (F) The stability of Ga2O3 and I-TPGS/Ga2O3/TIG suspended in PBS (n=3). (G) The stability of Ga2O3 and I-TPGS/Ga2O3/TIG suspended in water (n=3). (H) The in vitro drug release behaviors of Ga2O3/TIG and I-TPGS/Ga2O3/TIG nanoparticles in PBS (pH 5.5 or 7.4) at 37 °C under shaking (75 rpm) (n=3). (I) Cytotoxicity of Ga2O3, I-TPGS/Ga2O3 and I-TPGS/Ga2O3/TIG nanoparticles against HUEVC after 48 h incubation performed by MTT assay (n=3). In the following section, β-Ga2O3:Cr3+ nanoparticles loaded with tigecycline (TIG) were prepared using the anti-ICAM-TPGS as a capping agent. For convenience, the prepared β-Ga2O3:Cr3+, anti-ICAM-TPGS/β-Ga2O3:Cr3+ were abbreviated as Ga2O3 and I-TPGS/Ga2O3, respectively. TPGS was firstly treated with the succinic anhydride to obtain the TPGS-COOH. 1H-DMR spectrums displayed that TPGS-COOH had the characteristic peaks of TPGS, but also had two new peaks emerging at 2.63 ppm and 2.66 ppm, respectively (Figure 1D). Apparently, the two peaks belonged to the methylene groups of succinic acid attaching onto the TPGS molecules, which suggested that TPGS was successfully converted into TPGS-COOH. Then, the anti-ICAM-TPGS could be easily obtained by conjugating TPGS-COOH with ICAM-1 antibody via condensation reaction. The conjugation efficiency of ICAM-1 antibody to TPGS/Ga2O3 has been measured via micro BCA protein assay, which was determined to be 84.92%. Similar to TPGS/Ga2O3, I-TPGS/Ga2O3 also had the average particle size of around 15 nm, indicating that the conjugations of ICAM-1 antibody onto TPGS had little impact on the stabilization of Ga2O3 (Figure S1). Herein, TIG was chosen as a model drug because it is widely used for the treatment of Klebsiella pneumoniae infection. From our previous research on Ga2O3 nanoparticles[17, 29], it was shown that the Ga2O3 obtained by calcination of GaOOH will form a pore structure, which may be due to the surface collapse of the nanoparticles caused by the loss of hydroxyl groups during calcination. Therefore, we can take advantage of the pore structure on the surface of Ga2O3 nanoparticles to encapsulate drugs. The TIG was then entrapped in the Ga2O3 by adsorption. By increasing the feed ratio of Ga2O3 to TIG from 50:1 to 5:1, both Ga2O3 and I-TPGS/Ga2O3 exhibited similar behaviors, showing decreases in the encapsulation efficiency (EE), but increases in drug loading (DL) for TIG (Figure 1E). This result demonstrated that the modification of anti-ICAM-TPGS had few effects on the EE and DL of Ga2O3 nanoparticles. We chose the I-TPGS/Ga2O3/TIG prepared with Ga2O3: TIG ratio of 5:1 in the following experiments because they had relative high drug loading capacity of 8.46 ± 0.51 %. The particle size of I-TPGS/Ga2O3/TIG was determined to be 15.33 ± 1.26 nm, indicating that the TIG loading had no significant effect on the particle size of the formulation. The stability of Ga2O3 and I-TPGS/Ga2O3/TIG was conducted in PBS and water, respectively. As shown in Figures 1F&G, the particle size and PDI of Ga2O3 and I-TPGS/Ga2O3/TIG nanoparticles did not change significantly within 7 days, indicating that the nanoparticles were well stabilized in PBS and water. As shown in Figure 1H, I-TPGS/Ga2O3/TIG and Ga2O3/TIG had similar drug release behaviors, with the encapsulated TIG quickly releasing from the nanoparticles during the initial periods of 10 h, followed by prolonged sustained releases through 72 h. Morphology observation of I-TPGS/Ga2O3/TIG before and after the pH 5.5 drug release study was conducted and the morphology of I-TPGS/Ga2O3/TIG TEM did not presented significantly change (Figure S2). Drug release profiles also revealed that the TIG release from I-TPGS/Ga2O3/TIG and Ga2O3/TIG was pH-independent, since their drug release behaviors at pH 7.4 were quite similar with that of pH 5.5 (Figure 1H), meaning the acidic environment of the inflammatory infection site (pH 5.5) [30, 31] did not significantly affect the release behavior, which allowed us to ensure the normal drug release behavior of the nanoparticles. The cytotoxicity of nanoparticles (Ga2O3, Ga2O3/TIG, and I-TPGS/Ga2O3/TIG) towards human umbilical endothelial vein (HUEVC) cells was evaluated via MTT assay. The results suggested that all of the nanoparticles had very low toxicities to HUEVC, as reflected by the observation that most of the cells (> 85%) were survival even when the concentrations used were up to 0.8 mg/mL (Figure 1I). The low toxicity of nanoparticles towards normal cells suggested they could be further applied in the following experiments. After the encapsulation of TIG, the antibacterial activities of I-TPGS/Ga2O3/TIG against TIG-sensitive Klebsiella pneumonia (KPN) and TIG-resistant Klebsiella pneumonia (TRKP) were subsequently investigated, and those treated with free TIG were applied as control groups. We found that the minimum inhibitory concentrations (MIC) and minimum bactericidal concentrations (MBC) ​​of free TIG, Ga2O3/TIG and I-TPGS/Ga2O3/TIG on KPN bacteria were quite similar, which were around 0.3 μg/mL and 0.6 μg/mL, respectively (Figures 2A&B). The in vitro antibacterial study of free I-TPGS and unloaded Ga2O3 were also studied and the results showed that both of these two formulations did not show significant antibacterial activity against both KPN and TRKP bacteria. Their MICs on both bacteria exceeded 1 mg/mL. These results indicated that the three preparations studied had similar antibacterial efficacy in term of inhibiting the growth of KPN. In contrast, the antibacterial activities of the three preparations towards TRKP were quite different. It was found that both of Ga2O3/TIG and free TIG groups showed similar MIC and MBC values ​​of about 1.8 μg/mL and 3.6 μg/mL, respectively. However, the MIC and MBC values ​​of the I-TPGS/Ga2O3/TIG nanoparticles were greatly reduced to 0.6 μg/mL and 1.2 μg/mL, respectively. The results indicated that the antibacterial activity of Ga2O3/TIG towards TRKP could be significantly improved by using the anti-ICAM-TPGS as a surfactant, further achieving the overcoming of the drug resistance to some extent. The antimicrobial activity of TIG in the presence of TPGS has also been studied and the results (Figure S3) also indicated a significantly improved antibacterial activity towards TRKP and the ability to overcome drug resistance with the presence of TPGS. We also observed and recorded growth curves of the three preparations on the growth of KPN and TRKP strains. In the case of KPN, free TIG, Ga2O3/TIG and I-TPGS/Ga2O3/TIG at a TIG concentration of 0.15 μg/mL could not restrain the bacterial growth because their CFU/mL values were remarkably increased after 22 h of incubation (Figure 2C). By increasing the concentration of TIG to 0.3 μg/mL, all of the three preparations exhibited slight change in CFU/mL values during incubation for 22 h, meaning that they were effective at inhibiting the bacterial growth at the TIG concentration of 0.3 μg/mL (Figure 2C). These results were consistent with the results in Figures 2A&B, demonstrating that TIG concentration had a considerable similar impact on the antimicrobial activity towards KPN, regardless of carrier type. In the case of TRKP, only I-TPGS/Ga2O3/TIG at a TIG concentration of > 0.6 μg/mL was able to prevent the bacteria from growth, showing slight increases of CFU/mL after 22 h of incubation, while TIG, Ga2O3/TIG at a TIG concentration of 1.2 μg/mL failed to inhibit the growth trend of TRKP (Figure 2D). These results were also consistent with the results in Figures 2A&B. Overall, I-TPGS/Ga2O3/TIG had much stronger antibacterial activity than Ga2O3/TIG and free TIG, revealing the ability to inhibit the drug-resistant TRKP from growth. One possible reason for the enhanced antimicrobial activity towards TRKP of I-TPGS/Ga2O3/TIG could be due to the fact that I-TPGS/Ga2O3/TIG had more uniform particle distributions, which could be easier for the particles to go through the cell wall of bacteria and deliver TIG. Previous studies have suggested that TPGS has the ability to overcome anticancer drug-resistance by efflux pump inhibition and endocytosis promotion [18, 30, 32]. We supposed that TPGS could also inhibit the activity of bacterial efflux pumps, thereby leading to an enhanced antimicrobial activity towards TRKP. In order to prove our hypotheses, we carried out the following experiments. In vitro antibacterial studies of I-TPGS/Ga2O3/TIG and control samples on KPN and TRKP. (A) MIC susceptibility semiquantitative profiles of TIG, Ga2O3/TIG and I-TPGS/Ga2O3/TIG against KPN and TRKP using microplate broth dilution method (n=3). (B) MBC susceptibility semiquantitative profiles of TIG, Ga2O3/TIG and I-TPGS/Ga2O3/TIG against KPN and TRKP (n=3). (C) Growth curves for KPN treated with various concentrations of TIG, Ga2O3/TIG or I-TPGS/Ga2O3/TIG (n=3). (D) Growth curves for TRKP treated with various concentrations of TIG, Ga2O3/TIG or I-TPGS/Ga2O3/TIG (n=3), *p<0.05. Investigation on mechanisms of I-TPGS/Ga2O3 overcoming drug resistance. (A) The fluorescent images and (C) semi-quantitative analysis (n=3) of fluorescence intensity of β-Ga2O3:Cr3+ after E. coli or S. aureus was incubated with Ga2O3 and TPGS/Ga2O3 for 4 h at 37 °C, respectively. The bacteria were labelled with Hoechst (blue), and the red fluorescence signal indicated the excited red fluorescence from β-Ga2O3:Cr3+. The scale bar is 20 μm. (B) The fluorescent images and (D) semi-quantitative analysis (n=3) of fluorescence intensity of β-Ga2O3:Cr3+ after KPN or TRKP was treated with Ga2O3 and I-TPGS/Ga2O3 for 4 h at 37 °C, respectively. The bacteria were labelled with DAPI (blue), and the red fluorescence signal indicated the excited red fluorescence from β-Ga2O3:Cr3+. The scale bar is 20 μm. (E&F) After TRKP was treated with I-TPGS, I-TPGS/Ga2O3 and TPGS for 20 h at 37 °C, respectively (n=3). The expression levels of (E) ramA and (F) acrB mRNA transcripts of I-TPGS/Ga2O3 treated TRKP, I-TPGS treated TRKP and TPGS treated TRKP were assessed by RT-PCR method. Untreated KPN and TRKP were used as control. *p<0.05, **p<0.01, ***p <0.001. The error presents the standard deviation from the mean. In order to the mechanism of the enhanced antibacterial activity of I-TPGS/Ga2O3/TIG towards KPN and TRKP, the behavior of nanoparticles being transported into bacteria and their effects on efflux pumps in resistant bacteria were further studied. Firstly, Escherichia coli (E. coli) and Staphylococcus aureus (S. aureus) were selected as representative strains of Gram-negative bacteria and Gram-positive bacteria, respectively. Ga2O3 with small particle size and uniform distribution was prepared with TPGS capping to investigate their transportation into bacteria considering small particles were supposed to cross the cross-linked cell wall barrier easier. Ga2O3 was applied as control. The bacteria were labelled by Hoechst (blue), while the Ga2O3 doped with Cr3+ could excite fluorescence as a fluorescent probe at an excitation wavelength of 635 nm (red). The observable fluorescent signals of β-Ga2O3:Cr3+ in Figures 3A&C proved that Ga2O3 could be internalized into both of Gram-negative bacteria and Gram-positive bacteria after 4 h of incubation at 37 ℃. Furthermore, the presented stronger fluorescent intensity of β-Ga2O3:Cr3+ in TPGS/Ga2O3 treated bacteria indicated that nanoparticles with a better dispersion were more readily internalized. Then, the bacterial uptake of I-TPGS/Ga2O3/TIG was further investigated on KPN and TRKP. The results showed that both of Ga2O3 and I-TPGS/Ga2O3/TIG could be taken up by KPN and TRKP after 4 h of incubation at 37 ℃, and the fluorescent signal of I-TPGS/Ga2O3/TIG nanoparticles in bacteria was significantly enhanced compared with that of Ga2O3 (Figures 3B&D). The results indicated that small-sized monodispersed nanoparticles were more easily to be internalized into the bacteria, thereby facilitating the intra-bacterial delivery of antibiotics. Then, the effect of I-TPGS/Ga2O3/TIG on the efflux pumps on TRKP was evaluated by measuring the expression level of efflux pumps-related genes via real-time RT-PCR method. Previous studies have reported that efflux pump gene (acrB) and transcriptional activator (ramA) could up-regulate the activity of multidrug efflux pump AcrAB in drug-resistant Klebsiella pneumonia, thus promoting the antibiotic resistance [20, 33]. The bacterial cultures of KPN and TRKP harvested in the mid-exponential growth phase were incubated with TPGS, I-TPGS and I-TPGS/Ga2O3 for 20 h at 37 ℃, respectively. As shown in Figures 3E&F, the expression levels of ramA and acrB in untreated TRKP were up-regulated by 12.8-fold and 5.6-fold compared with their expression levels in KPN, which confirmed that the overexpression of acrB and ramA were involved in the TIG resistance in TRKP. After treating with I-TPGS/Ga2O3/TIG, the expression levels of ramA and acrB in TRKP were down-regulated by about 4.3-fold and 3.6-fold, respectively. Similar trends were presented in the results of TPGS treated TRKP group and I-TPGS treated TRKP group, indicating that the presence of TPGS in I-TPGS/Ga2O3 played an important role in the inhibition of efflux pump genes. Although the expression levels of these two genes in TRKP were still higher than those of KPN, the significantly down-regulated gene expression levels still highlighted that I-TPGS/Ga2O3/TIG were able to inhibit the activity of efflux pumps in resistant bacteria to a large extent and posed a great potential to overcome bacterial resistance. In this way, the increased distribution of the antibiotic-loaded nanoparticles in the bacteria along with the reduced efflux of the loaded antibiotics could effectively overcome the drug-resistance in bacteria and restore the sensitivity of bacteria to antibiotics. Cellular uptake study. (A) Western blot analysis of ICAM1 expression in LPS pretreated HUEVC (ICAM1 highly expressing) and untreated HUEVC (ICAM1 lowly expressing) cells. (B) Semi-quantitative analysis of expression levels of ICAM1 in LPS treated group and control group (n=3). (C) The cellular fluorescent uptake images and (D) semi-quantitative analysis (n=3) of fluorescence intensity of Ga2O3 or I-TPGS/Ga2O3 incubated with HUEVC for 2 h, 4 h and 8 h in the presence or absence of LPS pretreatment and ICAM1 blockage, respectively. HUEVC were labelled with DAPI (red), and the blue fluorescence signal indicated the excited blue fluorescence from β-Ga2O3:Cr3+. The bar is 40 μm. **p<0.01. In addition to inhibiting the bacterial efflux pump by the modification of TPGS, the targeting specificity of I-TPGS/Ga2O3 was also of particular concern, which was first evaluated in vitro using Human umbilical endothelial vein (HUEVC) cells. HUEVC was stimulated with LPS for 24 h to simulate the pathological endothelium state of the cells in the infected sites. Western blot analysis revealed there was a significant increase in the expression level of ICAM1 in LPS-incubated HUEVC (Figures 4A&B), suggesting that pathological endothelium of HUEVC with over-expressed ICAM1 was successfully established. To conduct the cellular uptake studies, HUEVC with or without LPS pretreatment were incubated with Ga2O3 and I-TPGS/Ga2O3 for 2, 4 and 8 h, respectively. Fluorescent images of HUEVC incubated with I-TPGS were also observed as a reference (Figure S4). ICAM1 blockage experiment was also conducted to further investigate the endocytosis of I-TPGS/Ga2O3. The cells were labelled with DAPI (red), and Ga2O3 (β-Ga2O3:Cr3+) could excite fluorescence as a fluorescent marker (blue). It was observed that the cellular uptake behaviors of I-TPGS/Ga2O3 and Ga2O3 were time-dependent in all the groups (Figures 4C&D). The results also revealed that the fluorescent signal in HUEVC treated with I-TPGS/Ga2O3 was stronger than that treated with Ga2O3, which could be owing to the improved dispersibility and stability of nanoparticles after I-TPGS modification. We also observed that the pretreatment of LPS resulted in a significantly increased fluorescence intensity of I-TPGS/Ga2O3 (Figures 4C&D). Given the fact that LPS incubation could result in an increased expression of ICAM1, the reason could be related to the specific binding between the ICAM1 antibody on the surface of I-TPGS/Ga2O3 and ICAM1 adhesion molecules on the cell surface under inflammatory pathological state. In addition, the uptake of I-TPGS/Ga2O3 was significantly reduced after the ICAM1 blockage, which further confirmed that the specific interaction between I-TPGS/Ga2O3 and ICAM1 epitopes could contribute to a higher internalization (Figures 4C&D). The targeting specificity and enhanced cellular internalization of I-TPGS/Ga2O3 were of great significance to increase the effective concentration of antibiotics in the infected sites and to treat the intracellular infections more effectively. In vivo biodistribution study. (A) Schematic illustration for the procedure of β-Ga2O3 doped with Cr3+ used for bioimaging at an excitation wavelength of 635 nm. (B) The in vivo fluorescence images and (D) semi-quantified fluorescence signals (total signal/counts of the fluorescence signal per gram of tissue) of collected tissues from acute TRKP-infected pneumonia mice at 5 h, 24 h after intravenous injection with Ga2O3, TPGS/Ga2O3 and I-TPGS/Ga2O3. (C) The in vivo fluorescence images and (E) semi-quantified fluorescence signals (total signal/counts of the fluorescence signal per gram of tissue) of collected tissues from acute KPN-infected pneumonia mice at 5 h, 24 h after intravenous injection with Ga2O3, TPGS/Ga2O3 and I-TPGS/Ga2O3. (n=4) (F) Immunohistochemical analysis of livers and lungs from acute TRKP-infected and KPN-infected pneumonia mice using immunohistochemical staining for ICAM1 after 24 h of injection. The magnification was 200 times. *p<0.05. Then, the targeting specificity of I-TPGS/Ga2O3 was further investigated in vivo. Other than a drug carrier, I-TPGS/Ga2O3 could also be applied as a fluorescence probe here to observe its in vivo biodistribution after doping Cr3+ into β-Ga2O3 (Figure 5A). Herein, the acute pneumonia mouse model was established by injecting KPN and TRKP bacteria into the lungs of healthy mice via trachea. After intravenous administration, in vivo biodistribution of I-TPGS/Ga2O3 was observed at 5 h and 24 h, respectively. Ga2O3 and TPGS/Ga2O3 were used as control groups. The results indicated an increased fluorescent signal of I-TPGS/Ga2O3 in the lungs from 5 h to 24 h in both acute KPN-infected and TRKP-infected pneumonia mice. The strongest fluorescent signals (counts/g) in lungs presented a significantly increased accumulation in all of the collected tissues of I-TPGS/Ga2O3 treated mice (Figures 5B-E). At the meantime, Ga2O3 and TPGS/Ga2O3 treated mice failed to present a most accumulation in lungs other than other tissues. Obviously, a stronger fluorescent signal was always presented in the lungs of I-TPGS/Ga2O3 treated mice compared to that in lungs of Ga2O3 or TPGS/Ga2O3 treated mice, indicating an increased nanoparticles accumulation in the infected site via targeted delivery (Figures 5B-E). At the same time, the immunohistochemical results showed high expression of ICAM1 in the lungs of acute pneumonia mice after 24 h of injection, which suggested a specific delivery of I-TPGS/Ga2O3 into infected lung via the mediation of ICAM1 (Figure 5F). Meanwhile, a small amount of ICAM1 expression was also observed in the liver of these mice, so that I-TPGS/Ga2O3 could also be delivered to the liver to form a certain accumulation as reflected by the results of biodistribution study (Figure 5F). To sum up, bioimaging and lung targeting characteristic of I-TPGS/Ga2O3 were suggested here. And the targeted drug delivery by I-TPGS/Ga2O3 could effectively increase the concentration of antibiotics at the infected site at the same dose to achieve a better therapeutic effect. In vivo anti-infective efficacy assessments. (A) Schematic illustration for the procedure of the construction and treatment of the acute pneumonia mouse model. (B) Survival rates of acute KPN-infected pneumonia mice after treatments with saline, TIG, Ga2O3/TIG and I-TPGS/Ga2O3/TIG with a dose of 15 mg/kg, respectively. (n=6). (C) Survival rates of acute KPN-infected pneumonia mice after treatments with saline, TIG (15 mg/kg and 45 mg/kg), Ga2O3/TIG (15 mg/kg) and I-TPGS/Ga2O3/TIG (15 mg/kg), respectively. (n=6). (D&E) 48 h after the treatments, bacterial counts analysis in the lungs of acute (D) KPN-infected and (E)TRKP-infected pneumonia mice (n=3). (F) H&E staining images of lung and spleen of acute KPN-infected and TRKP-infected pneumonia mice after 48 h of treatments. The magnifications of lungs and spleens were 100 times and 40 times, respectively. (G) H&E staining images of liver and kidney of acute KPN-infected and TRKP-infected pneumonia mice after 5 days of I-TPGS/Ga2O3/TIG treatment, healthy mice were used as control. The magnification was 200 times. Scale bar = 100 μm. *p<0.05. After confirming that I-TPGS/Ga2O3/TIG could exert enhanced antibacterial activity in vitro, further effectively overcome bacterial resistance and possess a targeting specificity to the site of infection in vivo, the in vivo anti-infective activities were eventually evaluated using an acute pneumonia mouse model. After 5 hours of modelling, the mice were intravenously injected with different formulations (saline, free TIG, Ga2O3/TIG and I-TPGS/Ga2O3/TIG) (Figure 6A). Then, the survival rate, body weight and counts of lung colonies were recorded within 5 days (Figures 6B&C, Figure S5). After treating with the same concentration of bacteria, the survival rate of TRKP-infected pneumonia mice was slightly higher than that of the acute KPN-infected pneumonia mice, which could be explained as the virulence of the bacteria decreased with the acquisition of drug resistance [34, 35]. In these treatment groups, only I-TPGS/Ga2O3/TIG treated mice showed 100% of survival rate against KPN and TRKP infections (Figures 6B&C). Combined with previous results, the significantly improved treatment effect could be attributed to the ICAM1-mediated targeting delivery and TPGS-mediated better dispersibility, which allowed TIG-loaded nanoparticles to accumulate in the infected lungs and be endocytosed into epithelial cells, further achieving increased drug concentration and effective treatment of intracellular infections. Additionally, the survival rate of acute TRKP-infected pneumonia mice treated with 45 mg/kg of free TIG was 83.33%, which was still lower than that of groups treated with only 15 mg/kg of I-TPGS/Ga2O3/TIG (Figure 6C). The results suggested that the therapeutic effect of TIG could be greatly improved by loading TIG into I-TPGS/Ga2O3 nanoparticles, even when it was applied to drug-resistant infection. 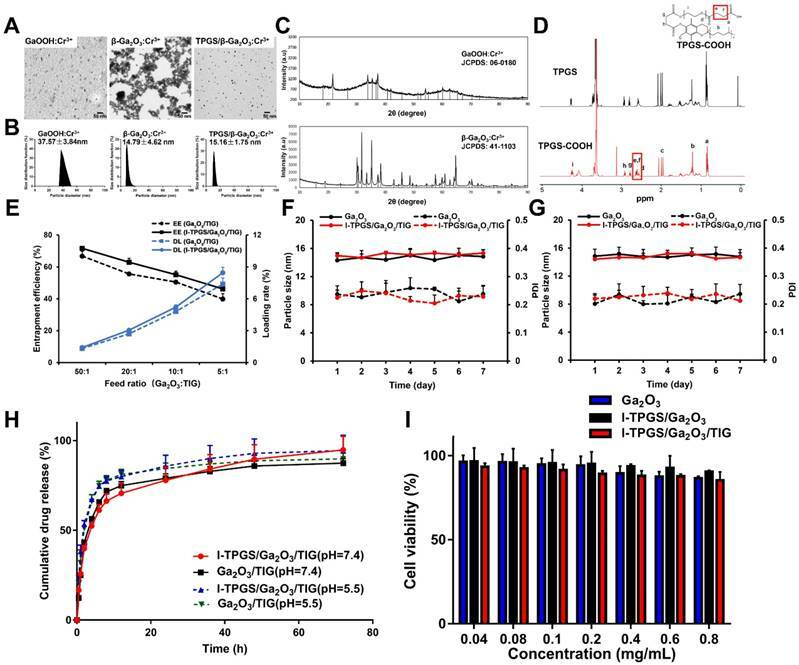 The previously demonstrated inhibited efflux pumps activity in TRKP mediated by TPGS capping could explain the superior performance of I-TPGS/Ga2O3/TIG in treating drug-resistant bacterial infections. The body weights of the mice were first decreased and then increased, and the minimum weight value was occurred at 48-72 h (Figure S2), indicating that the animals were gradually recovered after 48-72 h of treatment. The colony counts in lungs of these mice were therefore performed at 24 h and 48 h, respectively. In general, I-TPGS/Ga2O3/TIG exhibited excellent performance in the treatment of bacterial infections (Figures 6D&E). All of the treatment groups showed a decrease in the number of lung colonies after 24 h of administration, which demonstrated the antibacterial effect of the treatments. The number of lung colonies in the I-TPGS/Ga2O3/TIG group was significantly lower than that in other treatment groups (Figure 6D). After 48 h, the number of lung colonies in the TIG and Ga2O3/TIG groups were increased, while that of I-TPGS/Ga2O3/TIG group still remained at a low level (Figure 6E). Similar results were also found in the KPN-infected mice, demonstrating the superior ability of I-TPGS/Ga2O3/TIG to combating microbial and antimicrobial efficacy and ability to overcoming drug resistance. Previous studies have revealed that TPGS was able to inhibit efflux pumps in drug-resistant cancer cells [18, 19]. This work was the first time to apply TPGS in the inhibition of bacteria-resistant efflux pumps, which was further used to treat drug-resistant bacterial infections. As shown in Figure 5F, the infected mice presented some typical pathological features including enlarged lymphoid nodules on spleen, thickened alveolar walls and leukocytes infiltration on infected lungs. Histological improvements were observed after the treatments with TIG, Ga2O3/TIG and I-TPGS/Ga2O3/TIG. The improvement in these pathological changes was most pronounced in the I-TPGS/Ga2O3/TIG group compared to the other treatment groups at the same dose (Figure 6F). In addition to the outstanding therapeutic effects, the in vivo biosafety of I-TPGS/Ga2O3/TIG was also one of the issues we should deeply concerned. Referring to the previous results of in vivo biodistribution, there were higher accumulation of I-TPGS/Ga2O3/TIG in liver and kidney than other organs. The H&E staining of liver and kidney were therefore conducted after treating acute KPN-infected and TRKP-infected pneumonia mice for 5 days with I-TPGS/Ga2O3/TIG at the applied dose. 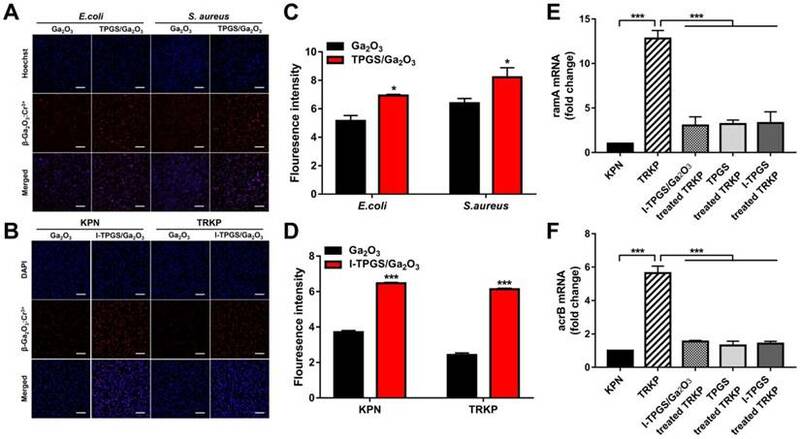 No observable pathological abnormalities or damages were found in the liver and kidney of the mice, which demonstrates that the use of I-TPGS/Ga2O3/TIG did not cause obvious side effect or damage to other normal organs during the antibacterial treatment (Figure 6G). After treating mice with saline and I-TPGS/Ga2O3/TIG respectively, the white blood cell (WBC) count, lymphocytes (Lymph) count, monocytes (Mon) count, neutrophilic granulocyte (Gran) count, red blood cell (RBC) count and haemoglobin (HGB) of the whole blood were then determined. The results (Table S1) showed that the injection of I-TPGS/Ga2O3/TIG did not have any significant effect on the haematology parameters of mice. Overall, in vivo results indicated that I-TPGS/Ga2O3 can be used as a safe and efficient antibiotic delivery system to achieve efficient treatment of drug-resistant bacterial infections. In summary, we prepared I-TPGS/Ga2O3 nanoparticles as a novel potential platform to encapsulate the antibacterial drug of TIG for a safe and effective targeted therapy of TRKP pulmonary infection. The results suggested that TIG could be loaded within the nano-sized I-TPGS/Ga2O3 particles, which had a superior in vitro antibacterial activity against the TRKP and overcome the drug-resistance to a certain extent. The small particle size and uniform distribution enabled the I-TPGS/Ga2O3 nanoparticles to be more easily internalized into the bacteria. TPGS modification of the nanoparticles could down-regulate the over-expression of the efflux pump genes in TRKP. In this way, the distribution of the antibiotic-loaded nanoparticles increased with the decrease of efflux of the loaded antibiotics, which could effectively overcome the drug-resistance in bacteria and restore the bacterial sensitivity to antibiotics. The in vivo and in vitro distribution studies presented that the conjugated ICAM1 antibody could specifically deliver I-TPGS/Ga2O3 to the infected sites. In addition, Ga2O3 could be used as a fluorescent probe because of its photoluminescence properties, thereby avoiding multiple steps of additional grafting of fluorescent probe onto the nanoparticles. Finally, we applied I-TPGS/Ga2O3 to treat the acute pneumonia mice caused by KPN and TRKP infection. The greatly increased survival rates, largely reduced number of lung colonies, and significantly improved degree of pathological changes observed in I-TPGS/Ga2O3/TIG treated groups suggested that I-TPGS/Ga2O3/TIG could provide a safe and effective treatment of drug-resistant bacterial infections. We innovatively applied TPGS to overcome bacterial resistance and targeted deliver antibacterial drugs to infected sites through the mediation of ICAM1 antibody, eventually providing a novel approach with great potential and application value for the treatment of drug-resistant bacterial infections. Additionally, I-TPGS/Ga2O3 can be further developed and applied it to the diagnosis and real-time monitoring of anti-infective treatments by virtue of their own fluorescent properties. Gallium oxide (Ga2O3), D-α-Tocopherol polyethylene glycol 1000 succinate (TPGS1000), sodium acetate (NaAC), glacial acetic acid, hydrogen peroxide (H2O2, 30%), chromic nitrate nonahydrate (Cr(NO3)3·9H2O) were purchased from Aladdin Chemistry Co. (Shanghai, China). Lipopolysaccharide (LPS), succinic anhydride, N-(3-Dimethylaminopropyl)-N'-ethylcarbodiimide hydrochloride (EDC), 4-Dimethylaminopyridine (DMAP), N-hydroxysuccinimide (NHS), 4', 6-diamidino-2-phenylindole (DAPI), Hoechst 33342 and 3-(4,5-dimethylthiazol-2-yl)-2,5-diphenyltetrazolium bromide (MTT) were purchased from Sigma-Aldrich Co., Ltd (USA). All of the other chemicals were of analytical or chromatographic grade. Dulbecco's modified Eagle's medium (DMEM, high-glucose) with penicillin (100 U/mL) and streptomycin (100 U/mL) were purchased from Corning (USA). Human umbilical endothelial vein (HUEVC) cells were obtained from the Institute of Biochemistry and Cell Biology (Shanghai, China) and then cultured in DMEM supplemented with 10% (v/v) fetal bovine serum (FBS) with the environmental condition maintained at 37 °C in an atmosphere of 5% CO2/95% O2 with 90% relative humidity. The cells were sub-cultured regularly using trypsin/EDTA. Mouse anti-mouse Anti-ICAM1 antibody (ab171123) and rabbit anti-human ICAM1 antibody (ab53013) were purchased from Abcam (Cambridge, MA). Escherichia coli ATCC 25922 (E. coli), Staphylococcus aureus ATCC 29213 (S. aureus), tigecycline non-susceptible Klebsiella pneumonia 5542 (TRKP) and tigecycline susceptible Klebsiella pneumonia 55388 (KPN) were obtained from the First Affiliated Hospital, School of Medicine, Zhejiang University in China. Bacterial identification was performed by the Vitek 32 system (bioMérieux, France). The isolates were cultivated on nutrient agar plates, then harvested and cultured in LB medium or MH medium at 37 °C, 180 rpm under aerobic conditions grown to an OD600 of 0.5 ~ 0.6 that corresponds to the exponential phase. All experiments were performed in compliance with guidelines set by the Zhejiang University Institutional Animal Care and Use Committee. All animal procedures were conducted in accordance with national regulations and approved by the local animal experiments ethical committee. β-Ga2O3:Cr3+ nanoparticles were synthesized by improved method described in our previous publication. Briefly, GaCl3 solution was prepared by dissolving an appropriate amount of Ga2O3 in HCl solution (4 M) through stirring and heating at 95 oC. The synthesis protocol of 20 mL reaction system was illustrated here: NaAc (0.48 g) was dissolved in 16 ml of ethanol solution (50%, v/v), and then 0.4 mL of GaCl3 solution (0.8 M) was added under stirring. Next, glacial acetic acid was added dropwise until the cloudy mixture became transparent. Finally, 32 μL of a chromium nitrate solution (0.1 M) was added, and the mixture was heated and stirred at 50 ℃ for 5 h. The volume of the total reaction system in this step could be expanded to 2 L, thereby the reaction capacity was greatly increased as compared with that of most other hydrothermal reactions which usually does not exceed 100 mL, and the reaction capacity of reactions carried out using the kettle will be much smaller. [27, 28] After completed reaction, the white precipitate was separated by centrifugation, and collected after being washed with deionized water for 3 times. After drying at 60 ℃ for 24 h, the Cr3+ doped gallium oxyhydroxide (GaOOH:Cr3+) was then obtained. At last, the GaOOH:Cr3+ was calcined at 600 ℃ for 3 h, and then calcined at 950 ℃ for another 3 h to obtain β-Ga2O3:Cr3+ nanoparticles. The obtained nanoparticles were collected and dried under vacuum and stored in a four-degree refrigerator for further use. The hydrodynamic particle size and morphology of GaOOH:Cr3+ and β-Ga2O3:Cr3+ were observed by Zetasizer (S90, Malvern Co., UK) and transmission electron microscopy (80kV, TEM; JEM-1200EX, JEOL, Japan), respectively. The crystal structure crystal of GaOOH:Cr3+ and β-Ga2O3:Cr3+ were examined by X-ray powder diffraction (XRD) using a XRD (X' Pert PRO, Empyrean 200895, PANalytical B.V., the Netherlands). Firstly, TPGS-COOH was synthesized by activating TPGS with succinic anhydride (SA) via a ring opening reaction. Briefly, TPGS, SA and DMAP (1:2:1, mol/mol) was dissolved by adding an appropriate amount of anhydrous dioxane, and then allowed them to react at room temperature for 24 h under a nitrogen atmosphere. After that, the anhydrous dioxane was removed by rotary evaporation at 50 °C. The obtained crude product was then dissolved in 10 ml of ice-cold DCM, followed by passing through a filter (0.45 μm) to remove the unreacted SA. The filtrate was then allowed to precipitate in ethanol overnight at -20 °C. The precipitate was separated by centrifugation at 10,000 rpm for 10 min, and then TPGS-COOH was obtained by washing the precipitate with iced ethanol for 3 times. The structure of TPGS-COOH was confirmed 1H-NMR method (Bruker AVIII 500 Mspectrometer, Fällan-den, Switzerland). The anti-ICAM-TPGS/β-Ga2O3:Cr3 was prepared by conjugating ICAM1 antibody with TPGS-COOH/β-Ga2O3:Cr3+ via the amide reaction. In brief, TPGS-COOH/β-Ga2O3:Cr3+ was firstly prepared by dispersing 60 mg of β-Ga2O3:Cr3+ nanoparticles into 10 mL of TPGS-COOH solution (3 mg/mL), followed by ultrasonicating 5 min and centrifuging at 10000 rpm for 10 min. The TPGS-COOH/β-Ga2O3:Cr3+ precipitate was mixed with EDC and NHS (TPGS-COOH:EDC:NHS = 1:5:5, mol/mol) to activate the carboxyl group of TPGS-COOH at 37 ℃ for 15 min. The mixture was then centrifuged to collect the precipitate, which was then re-dispersed into water. Finally, the anti-ICAM-TPGS/β-Ga2O3:Cr3+ was obtained by putting 15 μg of ICAM1 antibody into the activated TPGS-COOH/β-Ga2O3:Cr3+ for 4 h via the amide reaction. The prepared β-Ga2O3:Cr3+ and anti-ICAM-TPGS/β-Ga2O3:Cr3+ were abbreviated as Ga2O3 and I-TPGS/Ga2O3, respectively. The I-TPGS/Ga2O3 was separated by centrifugation at 12,000 rpm for 10 min, and then washed with deionized water for 3 times. Then the content of ICAM-1 antibody in the obtained I-TPGS/Ga2O3 nanoparticles was determined using micro BCA protein assay, and TPGS/Ga2O3 nanoparticles was applied as control. The hydrodynamic particle size and morphology of I-TPGS/Ga2O3 were also examined by Zetasizer and TEM, respectively. To prepare TIG-loaded Ga2O3 (Ga2O3/TIG), an appropriate amount of Ga2O3 was mixed with was TIG solution (1 mg/mL), ultra-sonicated for 5 min, and then stirred overnight. As for the TIG-loaded I-TPGS/Ga2O3 (I-TPGS/Ga2O3/TIG), Ga2O3/TIG was used to conjugate with ICAM1 antibody via the same protocol described above. The obtained Ga2O3/TIG and I-TPGS/Ga2O3/TIG were collected by centrifugation and dried under vacuum and stored in a four-degree refrigerator for further use. The loading capacity and encapsulation efficiency was calculated by measuring the concentration of the free TIG collected in the supernatant via a UV-vis spectrophotometer (TU-1080, Beijing Purkinje General Instrument Co., Ltd., China) at a wavelength of 245 nm. The in vitro drug release behaviors of Ga2O3/TIG and I-TPGS/Ga2O3/TIG were evaluated in PBS (pH 5.5 and 7.4) via a dialysis bag method using PBS. The release medium was collected at predetermined time points, and then replaced with fresh PBS. The content of TIG was detected by High Performance Liquid Chromatography (HPLC) method to calculate the cumulative release percentage. The cytocompatibility of these formulations against HUEVC were performed using MTT method. The cell viabilities of Ga2O3, I-TPGS/Ga2O3 and I-TPGS/Ga2O3/TIG were then determined after the incubation with HUEVC under various concentration for 48 h respectively. Each measurement was conducted in triplicate. The in vitro antibiotic efficacy of free TIG, Ga2O3/TIG nanoparticles and I-TPGS/Ga2O3/TIG nanoparticles against TIG-sensitive Klebsiella pneumonia (KPN) and TIG-resistant Klebsiella pneumonia (TRKP) were evaluated by measuring the minimal inhibitory concentration (MIC), minimum bactericidal concentration (MBC) and growth curves, respectively. The bacteria used in the study were those harvested in the mid-exponential growth phase (absorbance at 620 nm was of 0.5 ~ 0.6). The MIC values of formulations (free TIG, Ga2O3/TIG, I-TPGS/Ga2O3/TIG, free I-TPGS and unloaded Ga2O3) were determined as the lowest concentration that completely inhibited bacterial growth after 20 h of incubation at 37 oC via microplate broth dilution method. For MBC tests, 50 μL of mixtures containing formulations and bacterial inoculum from the above MIC tests were incubated in agar plates for 24 h at 37 ℃. MBC was taken as the lowest concentration of formulations that did not show any bacterial growth on the inoculated agar plates. As for the growth curves tests, the KPN and TRKP cultures were firstly diluted to a concentration of 5 × 105 CFU/mL. Then, the KPN and TRKP were incubated (250 rpm, 37 ℃) with free TIG, Ga2O3/TIG I-TPGS/Ga2O3/TIG at different concentrations. The absorbance of these cultures at different time intervals were detected at the wavelength of 620 nm, and the CFU counts were calculated relative to a standard curve of the CFU counts. Escherichia coli (E. coli) and Staphylococcus aureus (S. aureus) labelled with Hoechst 33342 were used as model strains. The bacteria harvested in the mid-exponential growth phase were incubated with either Ga2O3 or TPGS/Ga2O3 (final Ga2O3 concentration of 0.5 mg/mL) for 4 h. Then, the fluorescence signals of Hoechst and β-Ga2O3:Cr3+ were observed by a confocal fluorescence microscope (Olympus IX81-FV1000, Olympus, Tokyo, Japan), and then were semi-quantitatively analyzed with Image J. In another study, same procedures were performed on the DAPI-labelled TRKP and KPN, respectively. The Oligonucleotide primers of acrB, ramA and 16S rRNA (Sangon Biotech (Shanghai) Co., Ltd) were used for the real-time RT-PCR. The 16S rRNA gene was served as a reference gene. The bacterial cultures of KPN and TRKP harvested in the mid-exponential growth phase were incubated with TPGS, I-TPGS and I-TPGS/Ga2O3 (final TPGS and Ga2O3 concentrations were of 0.1 and 0.2 mg/mL, respectively) for 20 h at 37 ℃, respectively. The DNase-treated RNA templates were then extracted from the treated bacterial cultures using RNAiso Plus. The concentrations of RNA were determined using a Nanodrop spectrophotometer (Thermo scientific, MA, USA). After that, the cDNA was synthesized by a PrimeScript RT-PCR kit (TaKaRa Bio). Finally, the expression levels of the acrB and ramA genes were determined by real-time reverse transcription-PCR (real-time RT-PCR) method using a SYBR Premix Ex Taq kit (TaKaRa Bio) on an Applied Biosystems StepOnePlus Real-Time PCR system. Then the relative expression analysis of acrB and ramA were conducted using the 2-∆∆Cq method. HUEVC were firstly pretreated with LPS (final concentration of 400 ng/mL) for 24 h, and then the expression level of ICAM1 was measured by western blotting method. Briefly, HUEVC were lysed by lysis buffer (CelLytic M, Sigma-Aldrich, USA) and then centrifuged at 12000 rpm for 10 min to obtain the supernatant fraction. The enhanced BCA protein assay kit was then used to determine the concentration of protein present in the supernatant. The same amounts of denatured proteins were run in a 10% sodium dodecyl sulfate polyacrylamide gel electrophoresis, and transferred to a poly(vinylidene difluoride) membrane. For blocking the nonspecific sites, the poly(vinylidene difluoride) membrane was then infiltrated in bovine serum albumin (5%) for 1 h at room temperature. After incubation with the mouse anti-mouse Anti-ICAM1 antibody (1:2000) at 4 °C overnight, the goat anti-rabbit IgG (1:1000, Byotime Biotech, Jiangsu, China) secondary antibodies were applied to incubated with the washed membranes for 2 h at room temperature. β-actin was used as a control. The results of western blotting were visualized by the LI-COR Odyssey system (Lincoln, NE). Afterwards, I-TPGS, Ga2O3 and I-TPGS/Ga2O3 (final Ga2O3 concentration was of 0.2 mg/mL) were incubated with either LPS-pretreated or LPS-untreated HUEVC for 2, 4 and 8 h, respectively. Meanwhile, a blocking group was prepared by pretreating the HUEVC with free ICAM1 antibody (3 μg/mL) for 1h. HUEVC were labelled with DAPI. The fluorescent signal of DAPI and β-Ga2O3:Cr3+ were observed by a confocal fluorescence microscope, then the fluorescent signals were semi-quantitative analyzed with Image J. 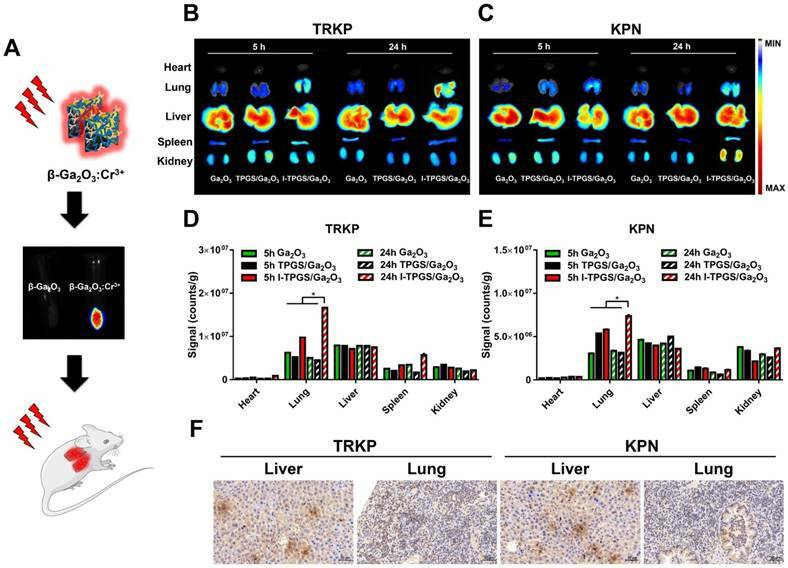 To build the acute KPN-infected and TRKP-infected acute pneumonia mouse models, 30 μL of KPN and TRKP (1×109 CFU/mL) were injected into the lungs of healthy mice (female, 23 ± 2 g) via trachea. After intravenously injected Ga2O3, TPGS/Ga2O3 and I-TPGS/Ga2O3 (dose of Ga2O3 were 100 mg/kg), the organs (heart, lung, liver, spleen and kidneys) were collected at 5 and 24 h, respectively. The fluorescence signal of β-Ga2O3:Cr3+ accumulated in these tissues were observed and analyzed using the IVIS® spectrum system (Caliper, Hopkinton, MA, USA). Immunohistochemistry analysis was further conducted on lungs and livers collected from sacrificed acute KPN-infected and TRKP-infected pneumonia mice after 24 h of administration. The in vivo antimicrobial activities of the formulations were evaluated by investigating the survival rates, body weights, and pathological changes. The treatments were carried out 5 h late after the modelling. The acute KPN-infected pneumonia mice were divided into four groups (n=6), and intravenously injected with saline, TIG, Ga2O3/TIG and I-TPGS/Ga2O3/TIG, respectively. The TIG content in each group was 15 mg/kg. On the other hand, the TRKP-infected pneumonia mice were divided into five groups (n=6), and intravenously injected with saline, TIG (15 mg/kg and 45 mg/kg), Ga2O3/TIG (TIG: 15 mg/kg) and I-TPGS/Ga2O3/TIG (TIG: 15 mg/kg), respectively. The survival rates and body weights of mice were evaluated within 5 days. In addition, more healthy mice were continued to be grouped and modeled according to the above-described protocols (n ≥ 8), and 3 mice in each group were sacrificed to collected their lungs at 24 h and 48 h, respectively. The lungs were grind on ice and centrifuged to obtain a supernatant. Then, the supernatant was applied to an agar plate for determine the colony counts after incubation at 37 ℃ for 24 h. Meanwhile, the lungs and spleens of these mice sacrificed after 24 h in each group were obtained for H&E staining and pathological observation. Finally, acute KPN-infected and TRKP-infected pneumonia mice were injected with saline (control group) and I-TPGS/Ga2O3/TIG (TIG: 15 mg/kg) to evaluate the in vivo biosafety of I-TPGS/Ga2O3/TIG (n=3). These mice were sacrificed at day 5, and their livers and kidneys were collected for H&E staining and pathological observation. Additionally, the mice were treated with saline (control group) and I-TPGS/Ga2O3/TIG nanoparticles (experimental group), then the whole blood of the mice was taken 5 days later. Blood analysis was performed to obtain relevant hematological parameters to further evaluate the biocompatibility of I-TPGS/Ga2O3/TIG nanoparticles. Each experiment was carried out in triplicate at least. Differences Comparative analysis between groups were analyzed with one-way analysis of variance (ANOVA) tests, and P-values < 0.05 were considered statistically significant. Values were presented as mean ± standard deviation (SD). All the statistical analyses were performed on Graphic Pad 7.0 and Microsoft Excel software. TPGS: tocopherol polyethylene glycol succinate; KPN: Klebsiella pneumoniae; TRKP: tigecycline-resistant Klebsiella pneumonia; TIG: tigecycline; Ga2O3: β-Ga2O3:Cr3+; I-TPGS/Ga2O3: anti-ICAM-TPGS/β-Ga2O3:Cr3+; DDS: nano-drug delivery system; ICAM1: intercellular Adhesion Molecule 1; TEM: transmission electron microscopy; XRD: X-ray powder diffraction; HUEVC: human umbilical endothelial vein cells; PSD: hydrodynamic particle size distribution; MIC: minimum inhibitory concentrations; MBC: minimum bactericidal concentrations; CFU: colony-forming unit; RT-PCR: reverse transcription polymerase chain reaction; H&E: haematoxylin-eosin. This work was supported by the Scientific Research Fund of Ministry of Health - Medical Science Major Technology Fund Project of Zhejiang Province (WKJ-ZJ-1609) and New Century 151 Talent Project of Zhejiang Province. Corresponding authors: duyongzhongedu.cn (Yong-Zhong Du); xiaoyangluedu.cn (Xiao-Yang Lu).